Editor's Note: We are currently, as time allows, replacing the majority of the photos in this diary entry with higher quality versions. The photos which have been replaced are marked with an 'H'. 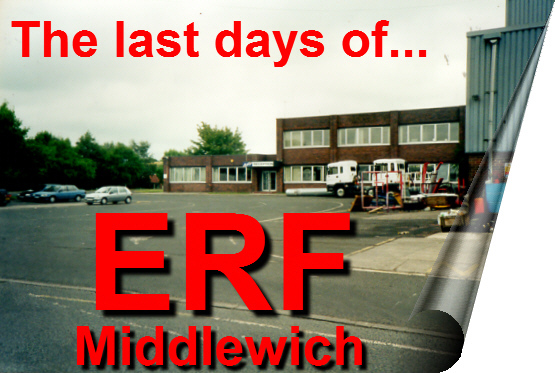 Several new photos of ERF Middlewich in its last days will also shortly be added. When we talk about the last days of ERF Middlewich, we need to be perfectly clear that we are talking about the last days of the ERF Service Centre which opened in 1971 and closed in 2000. 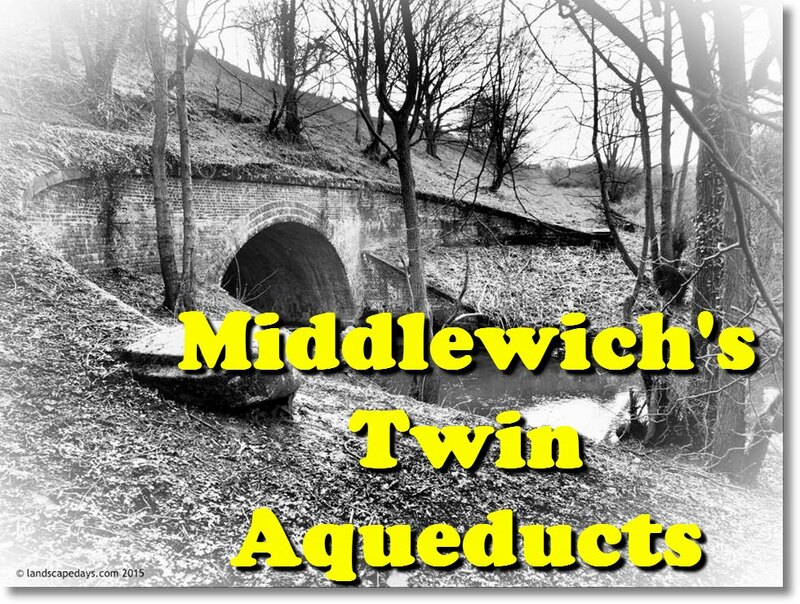 We are not talking about the make-believe 'factory' which was built at the end of Middlewich's truncated stub of a 'by-pass' at the fag end of the 1990s, and was so obviously not really intended to be a factory at all, but a warehouse. Which is precisely how it has ended up, with all its production facilities long removed. The last I heard, that 'factory' was a distribution centre operated by Wincanton Logistics. The part leading from Brooks Lane to ERF was made into a road and christened Road Beta which, as a name, is hardly much of an improvement. 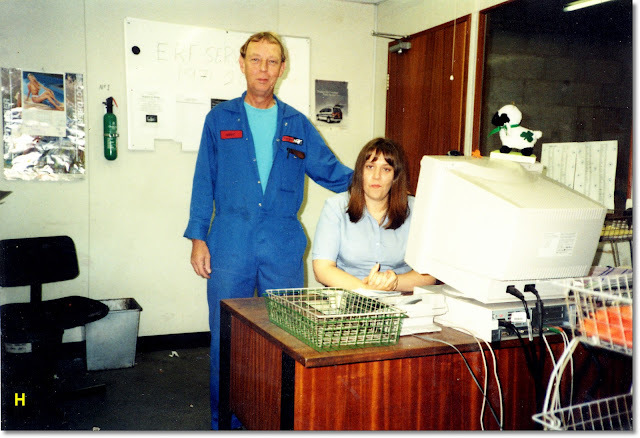 And from 1971 until it all came to a juddering halt in the year 2000 ERF Service Centre was the hub of ERF's parts distribution network and also provided at various times vehicle repair facilities, training schools, production lines and more. I'm writing this in the early hours of the 12th of September 2017. This is my 65th birthday, and the day on which, if things had worked out as planned, I would have been retiring from ERF. But things didn't work out as planned. They very seldom do. 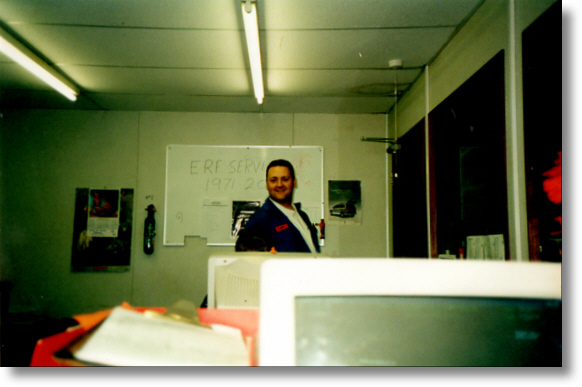 I worked at ERF Service from 1974 until it closed in 2000. 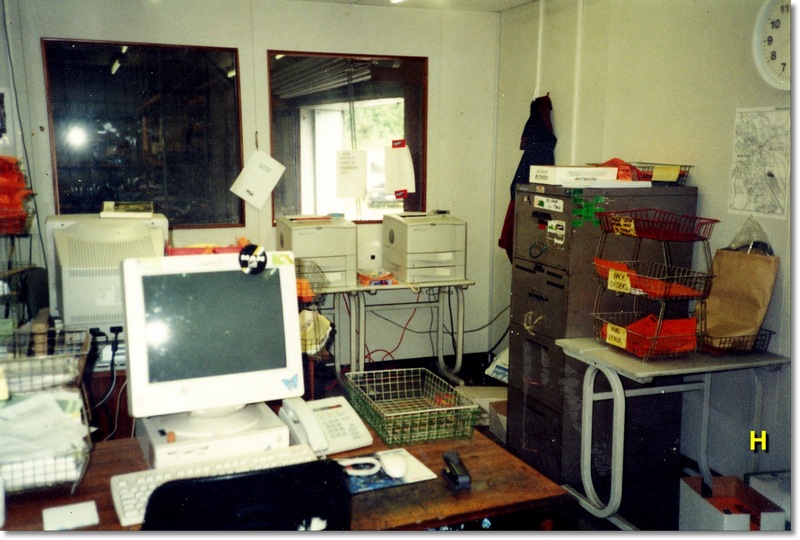 By that time it was plain that the Service Centre's days were numbered and that we were all going to be moving to the new 'factory' across the railway line and a couple of fields away from where we'd been working for all those years. The word factory is in inverted commas, like so much concerning the end of ERF in this diary entry, because so many of us remember the feeling we had at the time that the wool was being pulled over our eyes and all was not as it seemed. 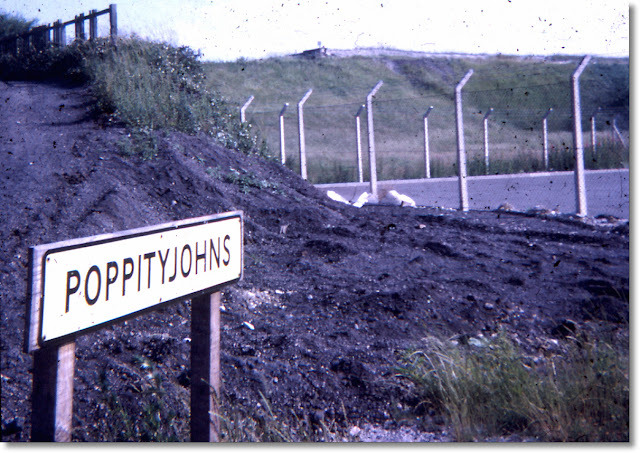 The problem was that ERF stores wouldn't be moving to ERF Way as the spur road off the 'bypass' had optimistically and, as it turned out, unfortunately, been named. 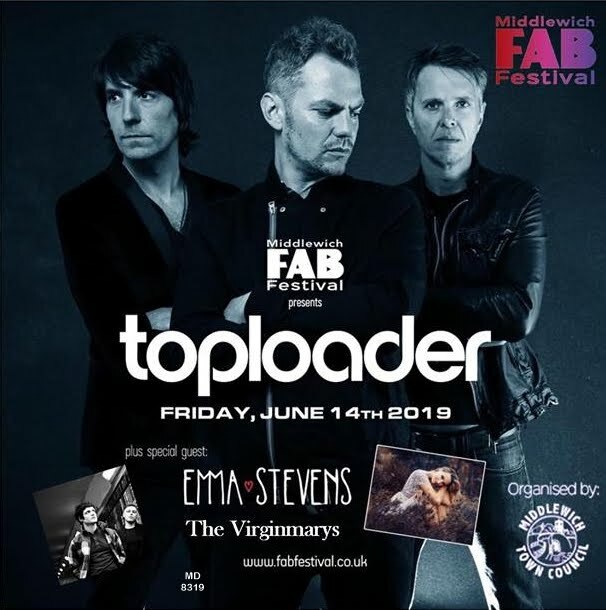 We'd heard tales of some autocratic ERF exec spotting the words Parts Distribution on the plans for the new site and abruptly drawing a line through them. Whatever jobs we were all going to do at the 'new place', they were not going to involve spare parts. 'Progress reports' on the building of the new 'factory' were pinned on notice boards at the Service Centre, and the more we saw of it the more puzzled we became. It just didn't look like a factory. It looked like a warehouse. Our union reps held shopfloor meetings and expressed their concerns. Those concerns reflected our own. 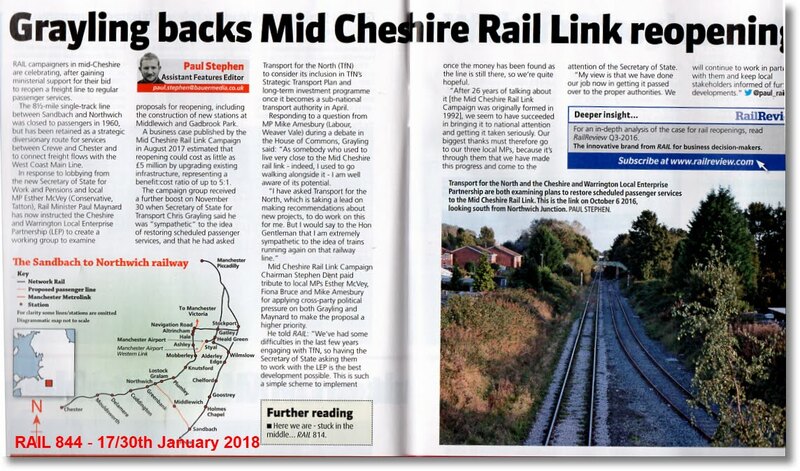 Of particular concern were the proposed cab line arrangements, with cabs having to be lifted and moved around on fork-lift trucks rather than on a proper production line. Like all management, then and now, the management of ERF considered everyone who worked for the company, particularly at our lowly level, to be mere units and completely interchangeable. This attitude was what put an end to my career with the company on my first day at the 'new place'. But that's another story. Before ERF Service passed into history I took a few photographs, mainly to capture for posterity some of the people who worked there and the place where we all spent our working lives. I fully realise that they will be of little interest to most people who never worked there, and quite a few people who did. 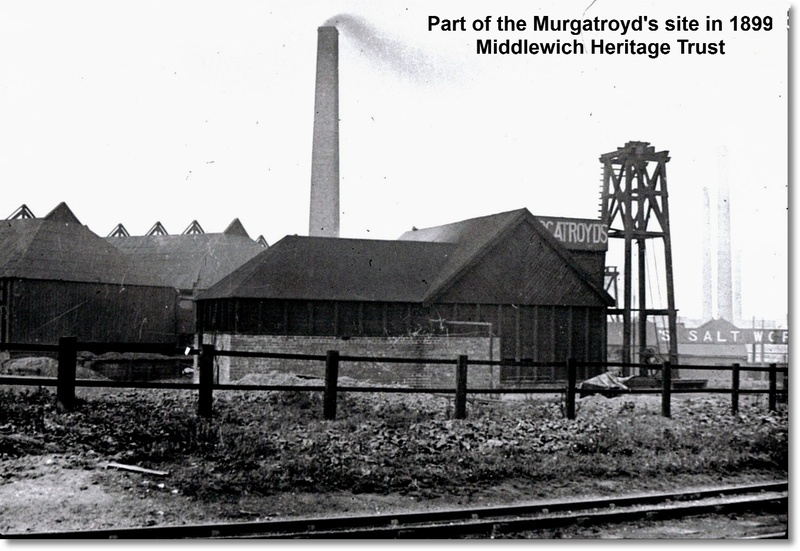 But these photographs, mundane and workaday as they might be, are at least a record of a Middlewich workplace which has vanished never to return, and of just a few of the people who worked there at the time. The photographs aren't in any particular order, and don't try to tell a story. 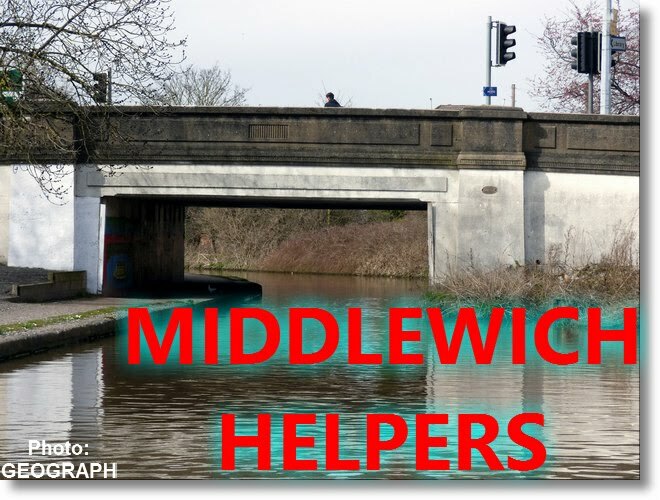 But they do, I hope, give a flavour of ERF Middlewich seventeen years ago. What better way to spend the day I should have retired than looking back at days which have, like, I'm sorry to say, a couple of the people pictured here, gone forever. That white box on stilts was the Goods Inwards (or Goods Receiving) office and underneath was Steve Farrington's domain. Steve was responsible for unloading, unpacking and checking deliveries. He'd then pass the advice notes to myself and Mr J.S. Davenport in our eyrie at the top of the stairs. Steve's domain. Note on the left hand side of the bench the computer which I can't recall Steve himself ever using. Like most shop floor people at ERF he regarded computers as the devil's work, and made a lot more use of the broom seen on the extreme left. A general view of the Goods Inwards office at the top of those stairs. The eagle-eyed observer will notice a portent of the future, in the form of the logo affixed to the computer screen in the foreground. A future which was, unfortunately, to be very short-lived. Note the printers by the window. These were used for printing Goods Inwards Notes(or 'GIN' notes) telling people which location in the stores to take spare parts to. Because of another one of those inexplicable management decisions you'll notice that the paper stock used to print these notes was a vivid - almost fluorescent - orange colour. 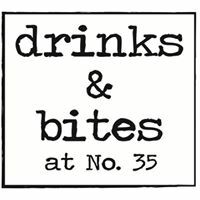 This was to ensure that anyone with even a slight hangover (which was most of us, most mornings) would end up with a blinding headache when trying to read them. the stores are in darkness (as evidenced by the windows) tells us that this was probably taken on one of those Friday nights when we'd spend hours waiting for spares to reach us via the M6 which, then as now, was the most accident-prone motorway in the country. 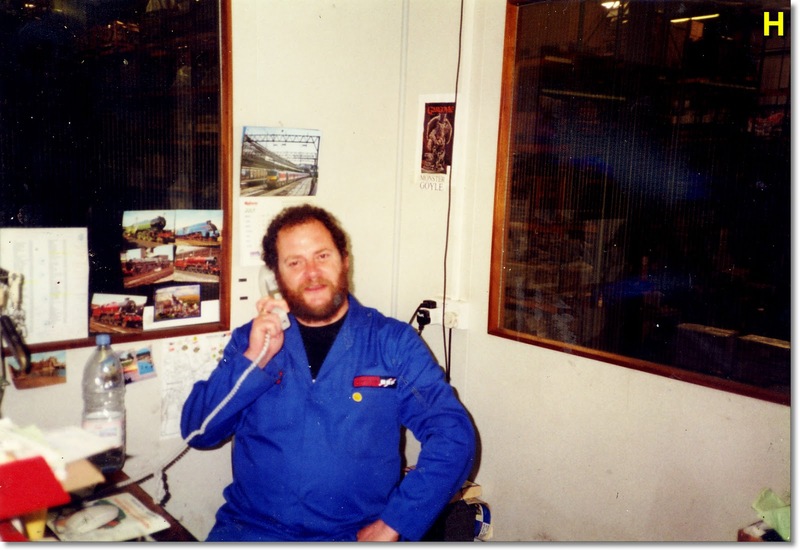 Note that, tellingly, Mr Roberts' office wall is covered with pictures of railway engines rather than trucks. 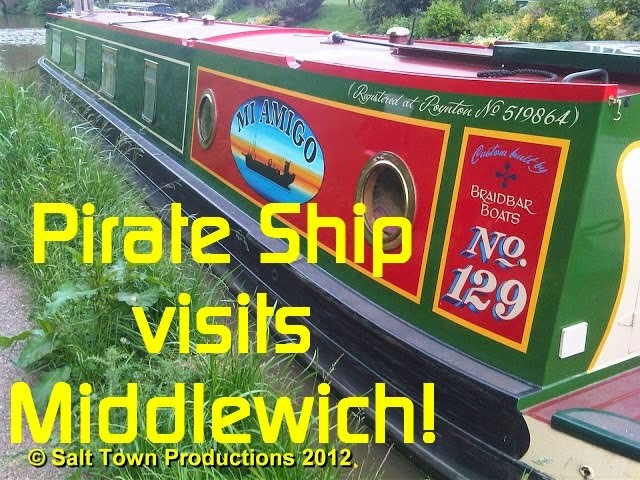 Everyone at ERF Middlewich had, apparently by law, to have some sort of a nickname. Thus we were always surrounded by people called things like Ferret, Weasel, Hippo, Stumpy, Wingnut, Arkwright, Goyle and so on. There was at one time a concerted effort to christen me 'The Prof' because of my having a preference for the clerical side of working in the stores, the fact that I took to working on a computer (the work of the Devil, let's not forget) like a duck to water, and the fact that I refused to contribute my full quota of 'f-words' to the daily conversation. Just to prove that I could hold my own with anyone on the shop floor I only went and passed my fork-lift truck driving test. 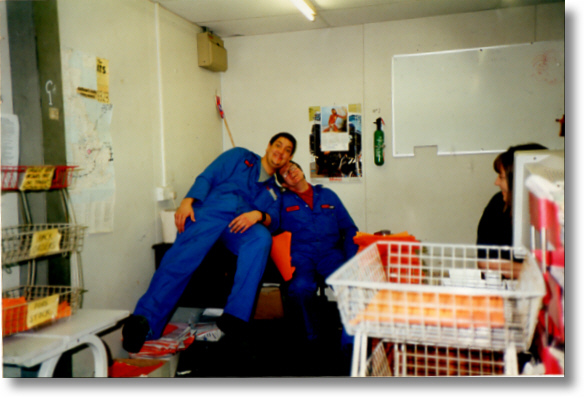 This was conducted by Mr Terry Carthy who, as well as being the FLT instructor in 1987, was also one of our foremen. Perhaps not the best foreman in the world but, nevertheless, wildly popular with everyone. You'll note that my precious licence only entitled me to drive counterbalance trucks. The much more difficult reach trucks were only for the truly talented. 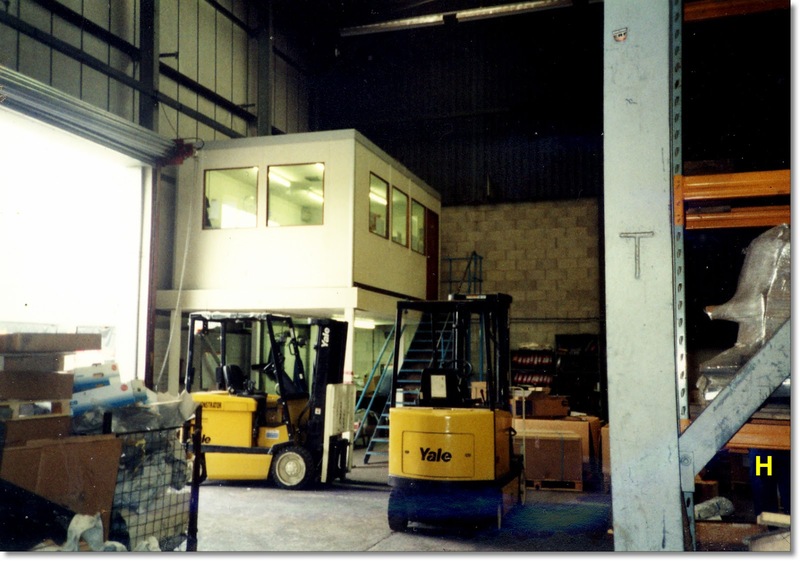 It's worth remembering that Steve Farrington (see above) didn't have to take an ERF fork lift driving test, on the grounds that it was he who taught Terry (the instructor) how to drive the trucks in the first place. That's how ERF rolled in those days though, to be fair, Terry had to go on an instructor's course somewhere or other before he was let loose on the rest of us. Eventually, of course, this whole silly 'in-house' FLT driving thing had to be abandoned and people had to take properly accredited courses run by people who really knew what they were doing. But at least my passing of the test - to the minor astonishment of all, including me, led to the dropping of the 'Prof' nickname. You never see a Professor driving a fork-lift. Something of a rarity - in fact unique in my experience - a lady storekeeper. Her name was June, and if I ever knew her second name, I've forgotten it. Update: Our old friend 'Anon' has put forward the name 'Proudlove' as June's second name. 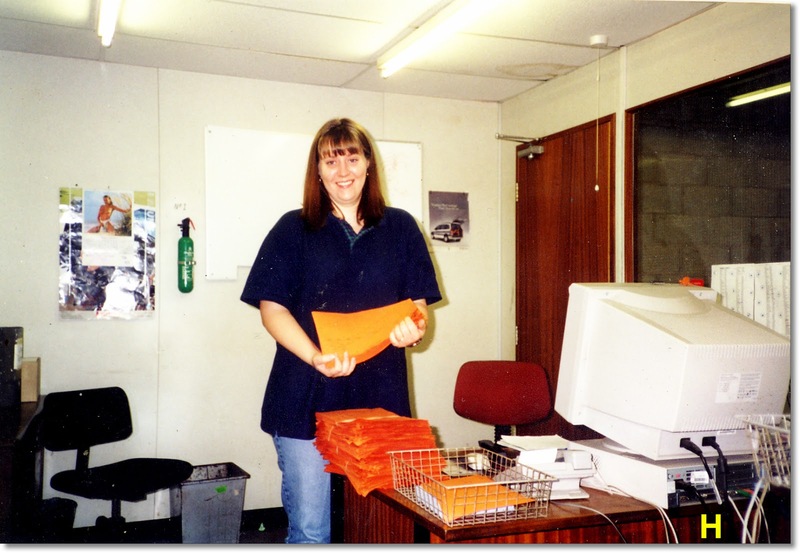 Also brightening the place up somewhat was Theresa, an agency worker brought in to help out with our 'heavy workload'. So little time...so much to do....just a tiny fraction of our 'heavy workload'. 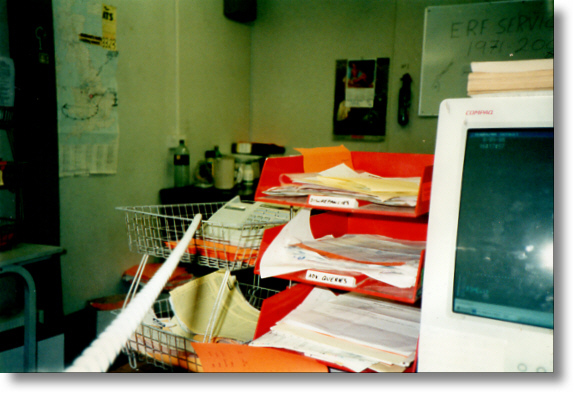 Note that someone appears to have dumped the telephone on one of the paper trays, possibly through sheer frustration after being 'mithered' once too often by Material Control at Sandbach. 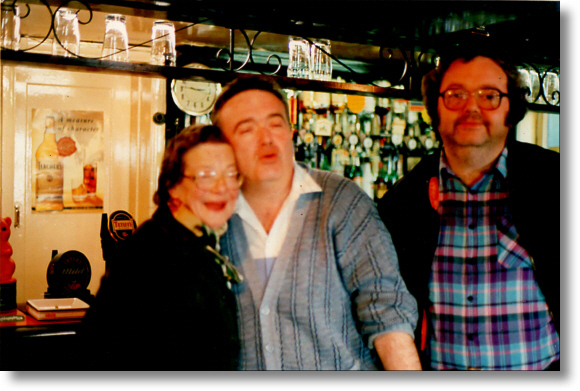 Here's Theresa again, this time with the late Harry Bayley. Andy Newall, once described by one of the foremen as 'doing the work of ten men'. and thus dubbed 'Cousin Herbert'. David 'Brisket' Briscall. 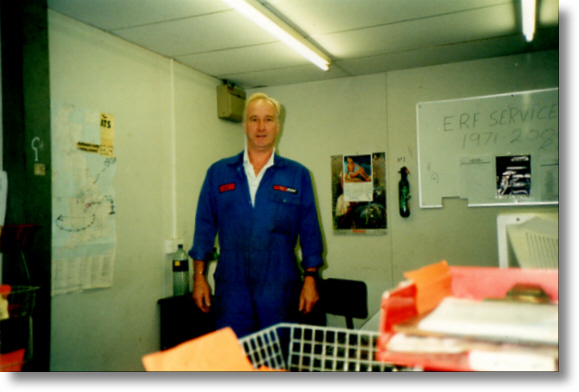 Note, in the background, the whiteboard with the words 'ERF SERVICE 1971-2000' written on it. Even a clapped-out old whiteboard has a tale to tell. 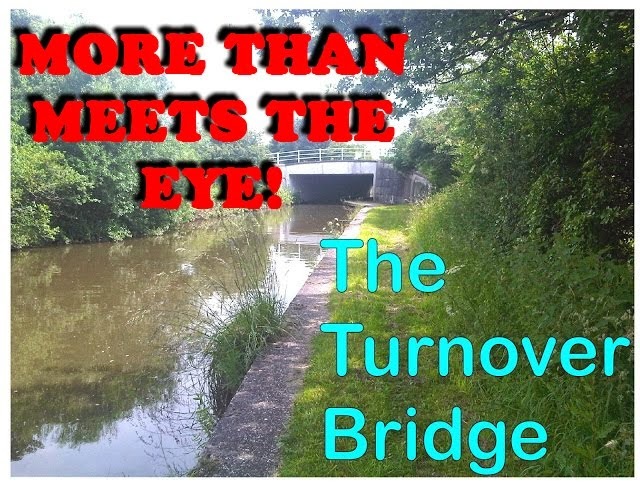 That tale is told in ''A Moment in Time' (link below). 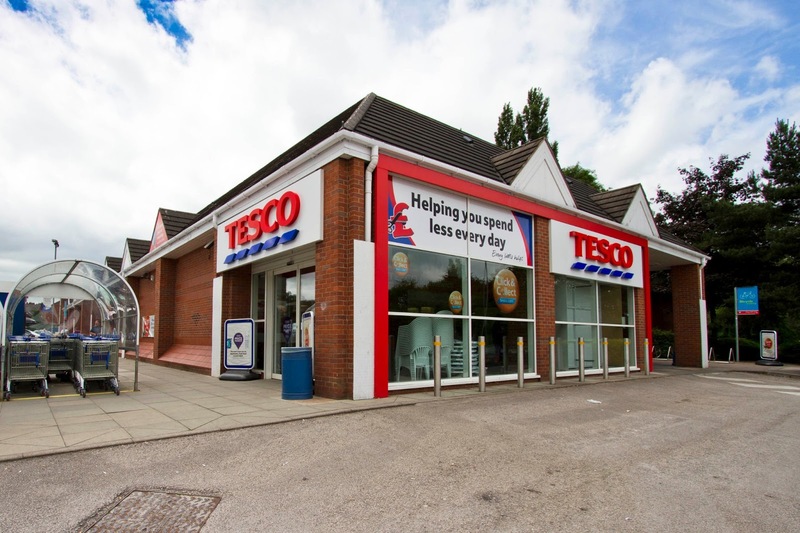 The 'high-racking stores', invariably referred to as the 'new stores' due to the fact that they were built later than - you've guessed it - the old stores. Special guided trucks operated here, very much on the same principle as guided buses and it was possible, when using 'lift trucks' (from one of which this photo was taken) to climb right into the roof of the building. An ideal method of getting out of the way and hiding from the foreman for a while. ...and at play, in the White Horse one Saturday lunchtime in the 1990s. That's Steve's brother Peter on the right. Steve was a true friend and, as I've said, we all still miss him after his untimely death a few years ago at the comparatively early age of 61. Note: Sadly, Peter Farrington also passed away in August 2018, after a short illness. R.I.P. Pete. And in the early months of 2018, the pub itself was consigned to history. The building still stands and looks much the same, though the ground floor has been converted into offices. The former living accommodation upstairs has, somewhat appropriately, been turned into overnight facilities for visiting truck drivers. 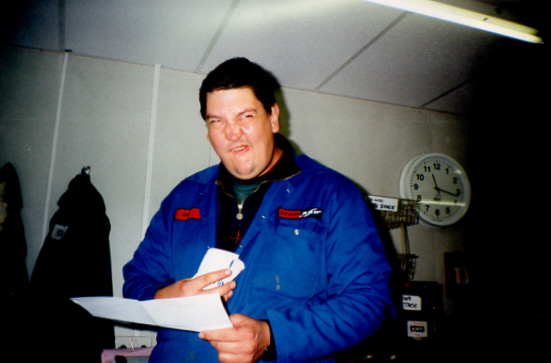 Mr Mark Wayne Brett Nevitt, storeman extraordinaire. 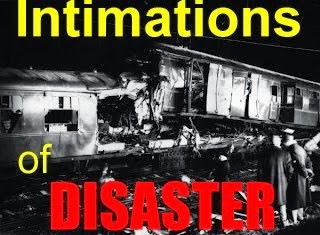 Now working for Network Rail as a signalman. The 'square'. 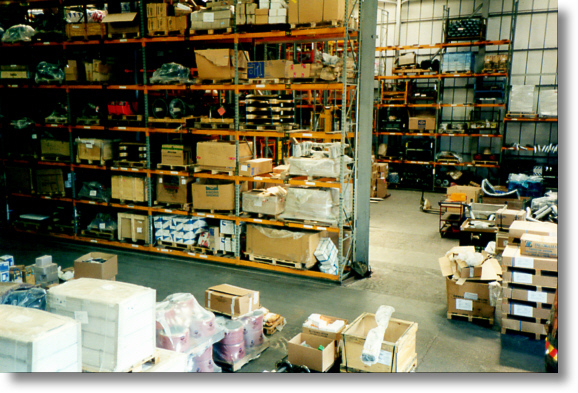 The area where goods were unpacked and checked ready to be placed in the stores. 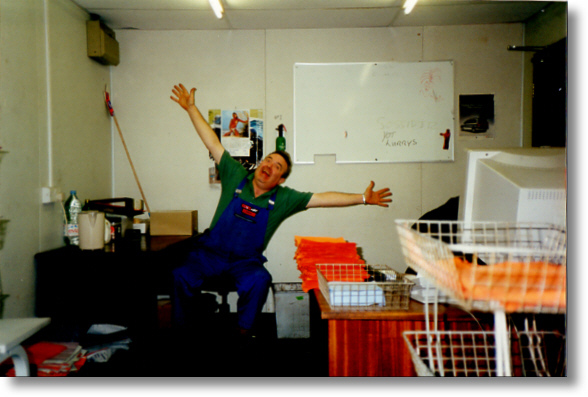 Mr Nevitt, ever eager to be photographed for posterity, adopts his 'I'm getting some work done, honestly Terry!' pose. 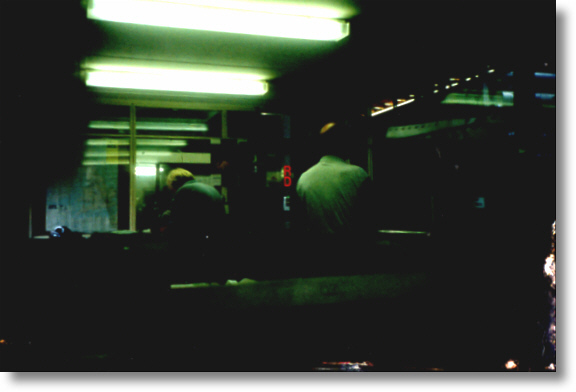 This dark and almost completely useless photo is included because it is the only known photograph of Mr John Stuart Davenport (in the background with red hair and blue shirt). We never were able to get a photograph of his face (which, some would say, was just as well). 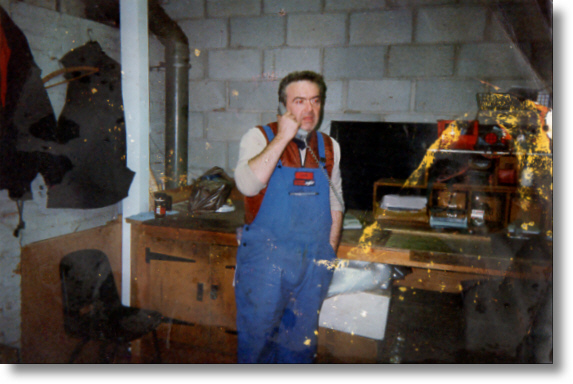 This photo was taken in the old, ground-floor Goods Inwards office (one of several we had over the years) which was very vulnerable to the attentions of fork-lift drivers who spent a lot of their time bending its tin walls, the chief exponent of this practice being Cousin Herbert Hampton, who also liked to bend the metal shutter doors of the stores about twice a week. The somewhat unprepossessing main entrance to the ERF Service Centre. The office block shown here no longer exists (although the main buildings are still in use). 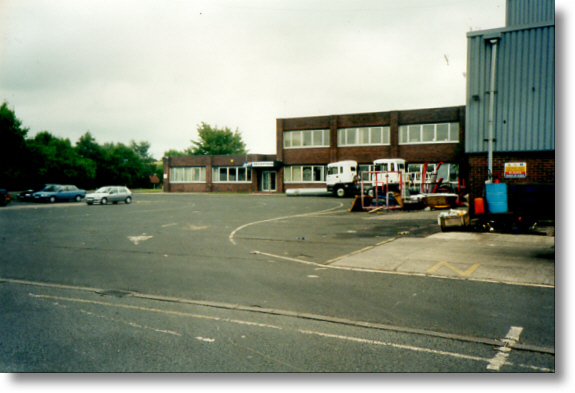 The single story building on the left was, in the 1970s, the works canteen. In the 1980s, in the days of mainframe computers, it became the 'Computer Room' where huge spools of magnetic tape whizzed to and fro and little lights blinked on and off in the approved manner. ..and here's one of the terminals that mainframe computer would have been connected to. 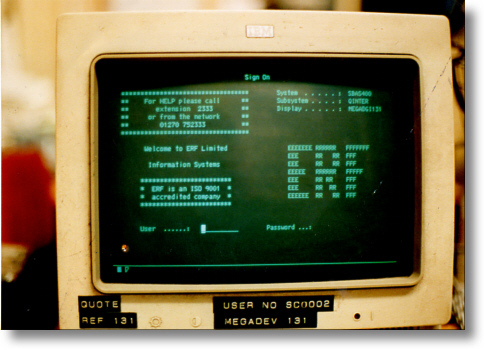 A CRT monitor with the then standard green-on-black screen and the letters ERF made up of smaller characters, something we all thought pretty impressive at the time. This was not even our first computer system. 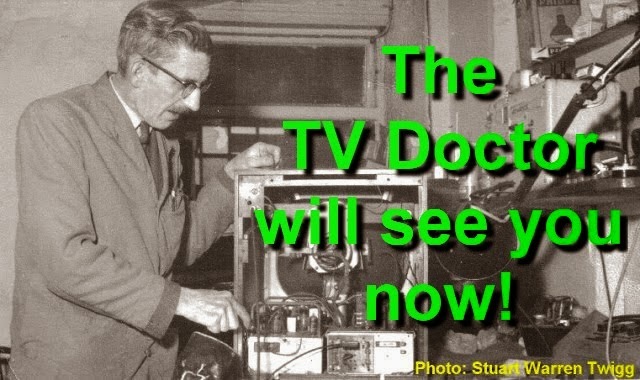 The earlier one, introduced at the very start of the 1980s, was in just plain black and white and the terminals had valves in them, just like your old-fashioned TV set. They had to be 'warmed-up' each morning. Later, like everyone else, we moved to desktop PCs. An interesting piece of ERF ephemera the like of which you'll never find in any museum of the British motor industry. You'll note that the user no. and the password necessary to log on to the system are plastered over the front of the terminal in Dymo tape. Computer security, ERF style! And here's something else you won't find in any museum of the motor industry. 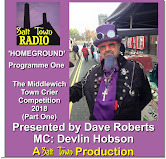 Dave's V.O.R. board, rescued from the ruins of ERF Middlewich in the year 2000. It's just a crummy old clipboard but, just by chance, it has preserved a tiny bit of ERF history in the form of the various labels stuck onto its surface. They were stuck there because...well...where else would you stick them? Rest assured, there were various suggestions, of varying degrees of obscenity, at the time. At the top of the board are the dreaded words 'Held V.O.R.'. 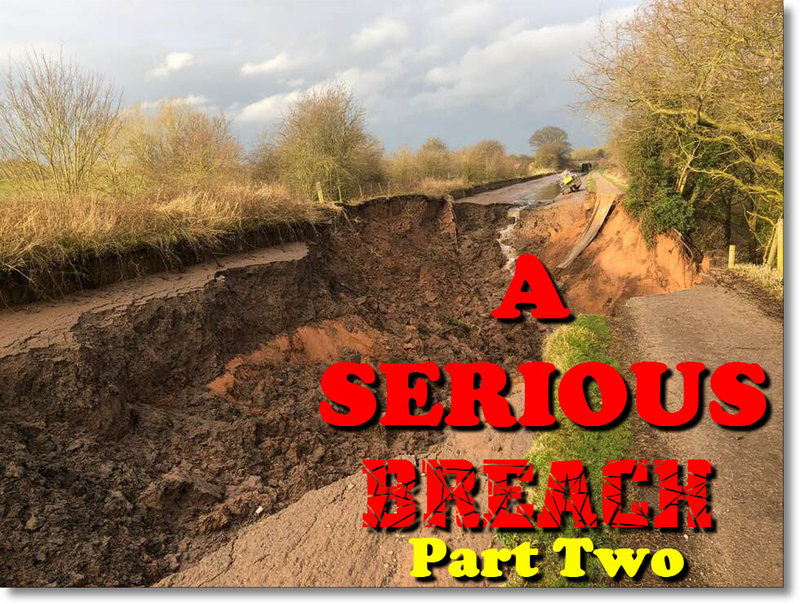 Each day we would list parts which were expected to be delivered and were to be set aside for that greatest of emergencies, a 'Vehicle Off Road' (V.O.R.). Any vehicle which was not running (and earning revenue) needed to be back on the road as soon as possible, of course, and this is where we listed those vital parts, ready to be sent out to the network to remedy the situation. But let's take a look at those stickers: The Gardner Diesel parts ones were stuck on every part received from the works in Patricroft, and just for good measure, the company would also send us great wads of the things with every delivery. The smaller Gardner sticker reads: 'Remanufactured at the Gardner Engine Plant, Patricroft, Manchester' and (a sign of the times) 'Specialists products from the Perkins Engine Group'. 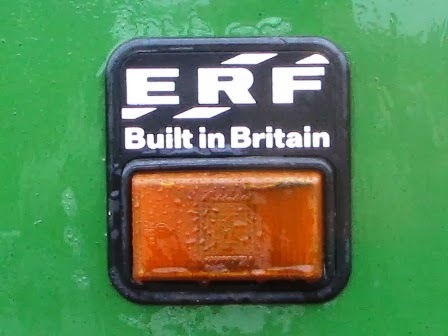 Then there's the standard 'Genuine ERF Parts' sticker, from the time after the 'Sunpar' (from 'Sun Parts') label had been dropped. We'd stick these all over various spares, sometime removing the manufacturer's label to do so, sometimes not. Then there's an 'intERFfit' label for the ever-increasing number of parts which would fit both ERF and other makes of trucks. There's a blue 'Stock Rotation Required' label and accompanying April, May, June, Oct stickers for such things as vehicle batteries, and the notorious green and orange stock labels to be affixed to goods inwards notes (GINs). The green ones indicated that one of the team of inspectors was needed to check that the parts in question were up to spec. For ordinary run-of-the-mill parts, a simple orange 'Pass Direct To Stock' label was used, creating great opportunities for the foreman to blame anyone and everyone if something went wrong. Then there's a standard ERF Genuine Parts label and a white and orange label used in the high-racking stores which, unusually, doesn't use the standard ERF logo. But it's that 'Encore' label which sticks in the memory. 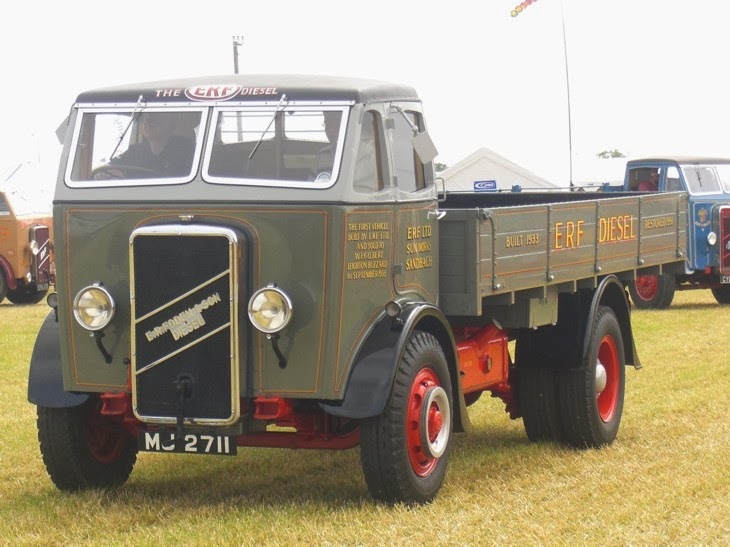 'ERF Encore' is an obvious name for a range of re-manufactured parts and the company used it for several years before quietly dropping it. 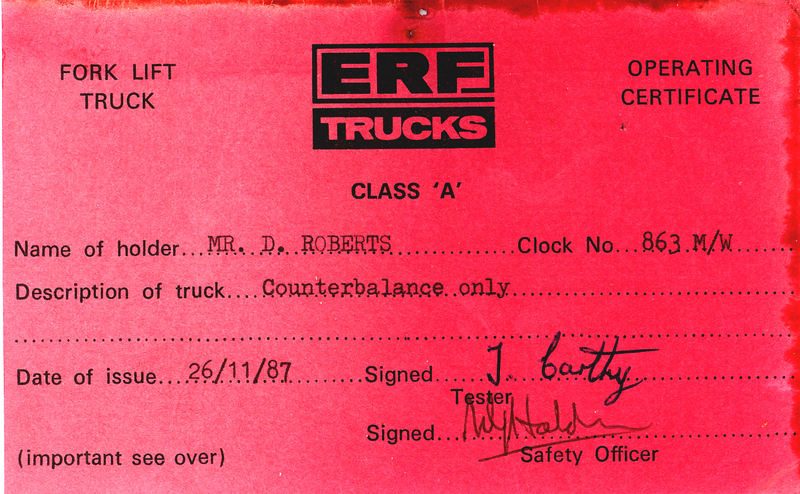 Sometime in the 1990s ERF decided that its range of re-manufactured parts should once again be given a special name. Almost unbelievably, no one could think of a name, and so the company asked its staff if anyone could come up with one, even offering a cash reward. Some bright spark came up with 'ERF Encore' and was thus paid for giving ERF back one of its own trade-marks. All the time that original 'Encore' label was sitting there on my clipboard, and I was wondering why the company didn't seem to have seen it before. It's a cliche, I know, but you couldn't make it up. You really, really, couldn't. The other side of the board contains a simple injunction asking people to refrain from nicking it, clipboards of all types being much in demand in all stores. By the time the year 2000 came along, no one cared. For the final time - I promise - here's that clipboard again with a piece of paper listing just a few of the thousands of part numbers we dealt with day in and day out for all those years. 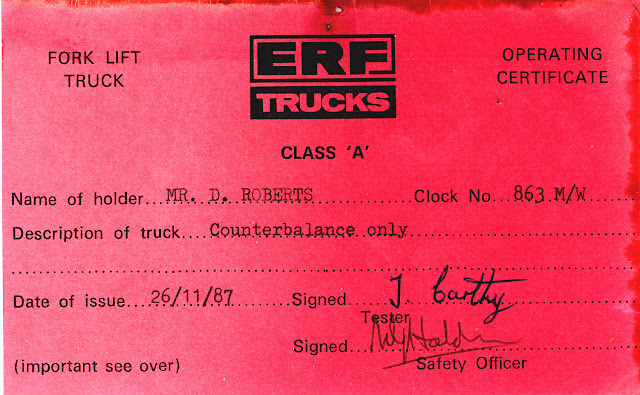 Sadly there are no descriptions on this list of parts received from 'ERF Production' (our name for the Sandbach works) without a valid purchase order (which we needed in order to book the parts onto the computer system). 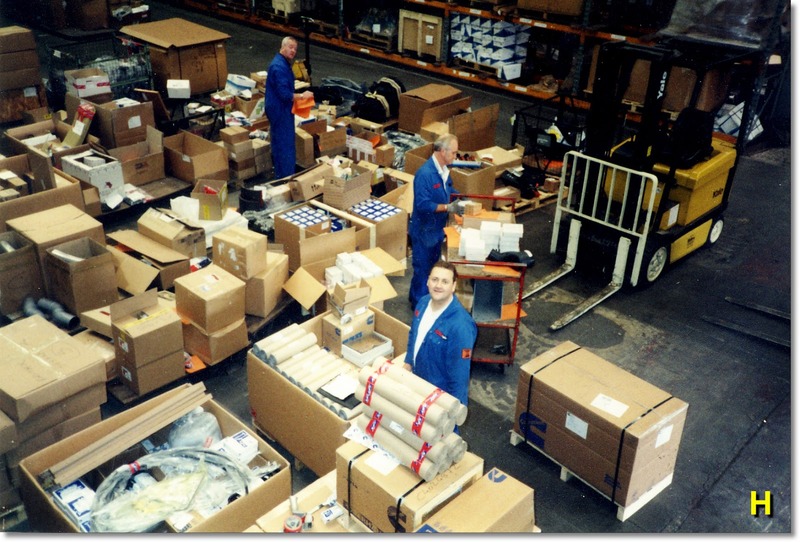 If you're wondering how it could ever be possible to supply parts without a purchase order, we wondered the same...constantly...What was really going on, of course, was that ERF Production's stores were periodically having clear-outs of parts which were less in demand as production of certain models was reduced. They needed the room for new parts for newer models and so used the service stores for the overflow. Thousands and thousands of parts were sent to us this way as 'stock transfers' on little white notes ('STS' notes). 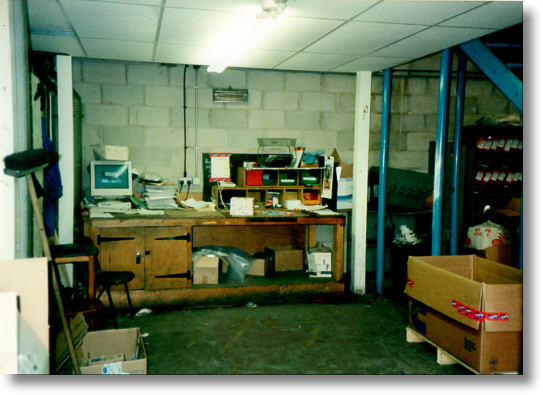 The parts distribution network used the same tactics under the guise of 'stock returns' and we'd all work hours and hours of overtime checking the old, dusty, frequently rusty and occasionally damaged parts into our stock, filling our limited space to bursting point. Anything which was so knackered and disreputable looking that it didn't meet even our very low standards was marked 'UFR' ('Unfit For Resale') and binned. 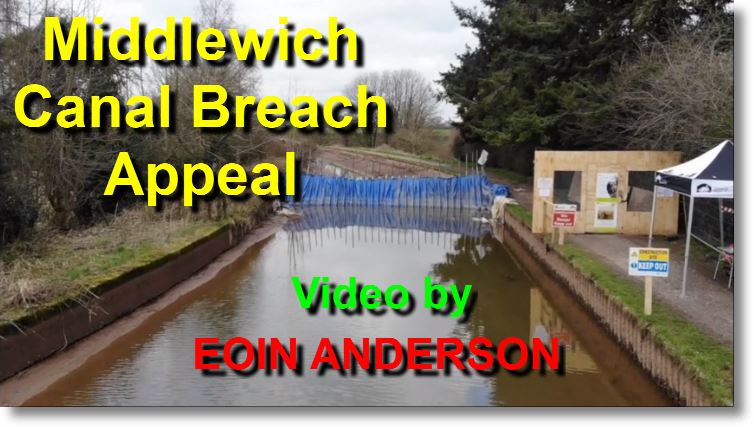 (an abridged version of this was published on the Foden & ERF Enthusiasts Facebook page on the 10th May 2018). 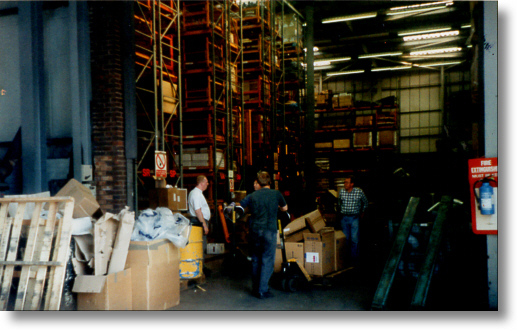 A general view of part of the ERF Service stores. 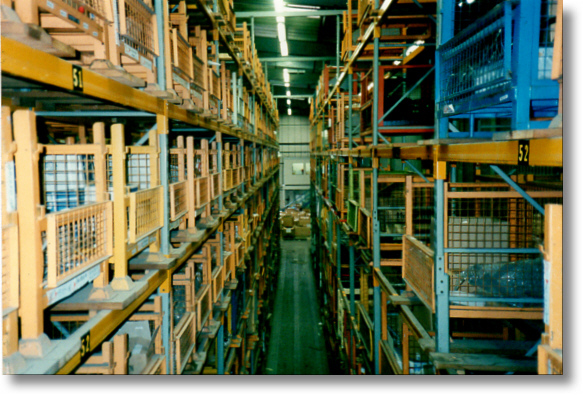 The 'square' is in the foreground, with the 'high racking' stores beyond. (or Jon?) Owen, a larger-than-life character from Birmingham, inevitably nicknamed 'Brummie'. As the time drew near for the move from Brooks Lane to the new, pretend 'factory' the company began transferring equipment to 'ERF Way'. 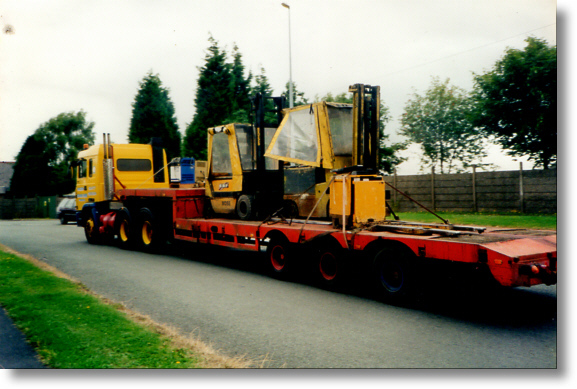 Here local firm Paces of Arclid loads fork-lift trucks in the yard, ready for the short trip 'up the road'. Moving out. 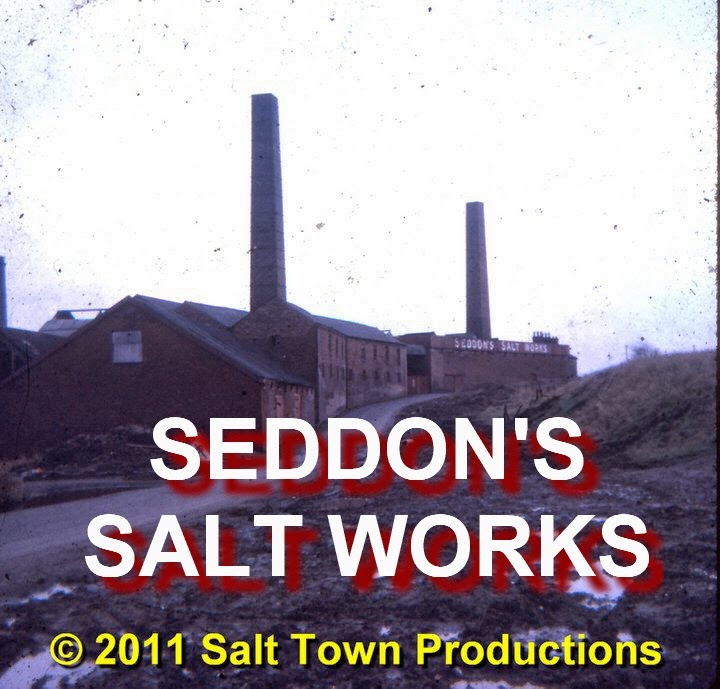 Off down Brooks Lane to Kinderton Street and then to ERF's brand new promised land in a field near the sewage works. to have his own personal computer at home. 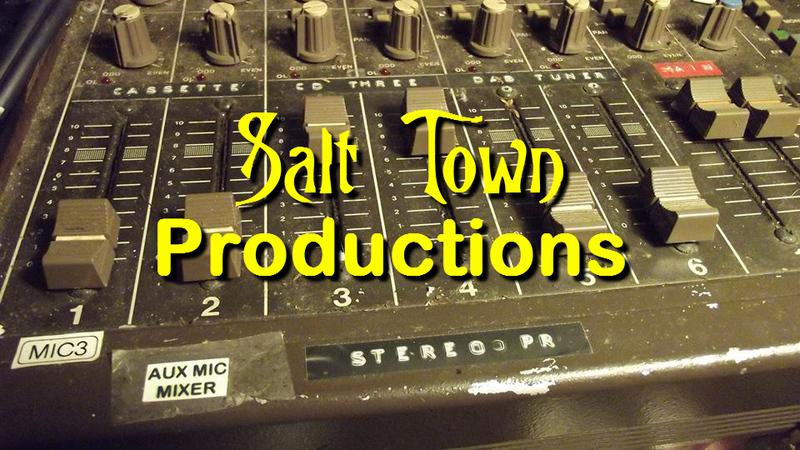 Note that the entertainment was provided by the Salt Town Poets, early forerunners of Salt Town Productions, without whom you wouldn't be reading this! 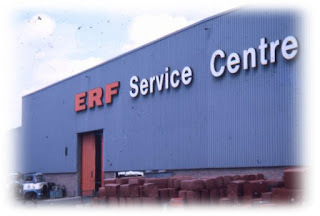 To ERF Management, of course, the closure of the ERF Service Centre was of little consequence, or interest. The parts operation was contracted out to a firm with facilities in Burton-on-Trent, and we were all given the great honour of teaching some of the new company's staff how to do our jobs so that we could be 'phased out' and given completely unsuitable jobs on the 'production line' at ERF Way. 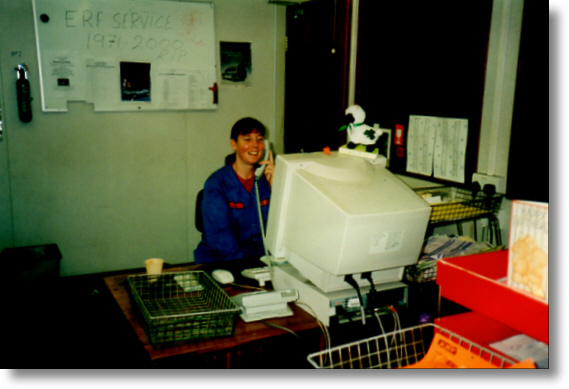 Although it may not have mattered a jot to the powers-that-be, some of us thought that the passing of the Service Centre deserved at least a little respect and ought to be marked in some way. 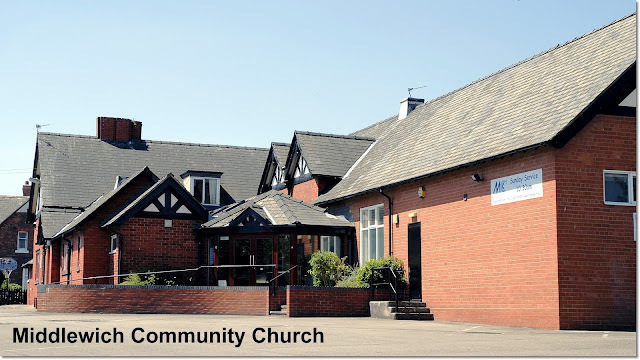 Accordingly, storeman John Smith, who had been staging Sixties Revival Nights at Northwich Memorial Hall, got everyone together for a social evening at the Pochin's Club just at the end of Road Beta (the building, formerly the ICI Club, is now home to Middlewich Community Church). 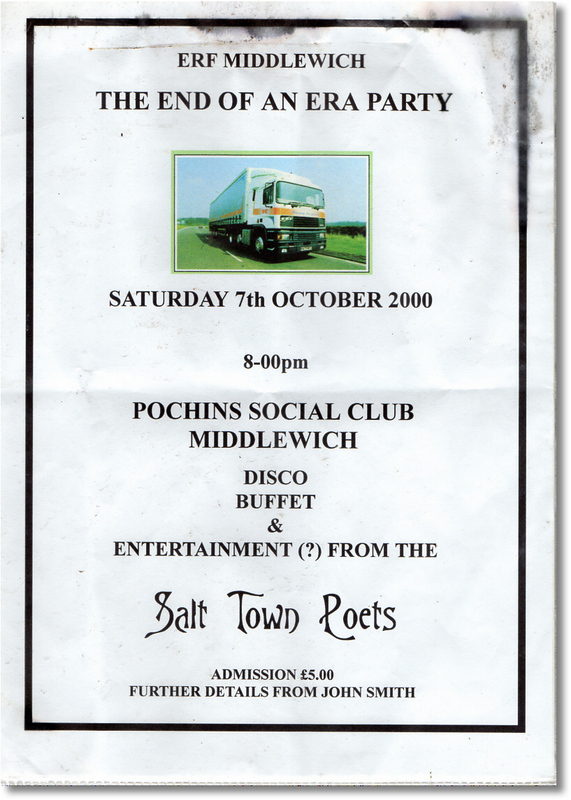 The former ICI/Pochin's Club in Brooks Lane, Middlewich, where we all gathered in October 2000 to commemorate the end of nearly thirty years of the ERF Service Centre. 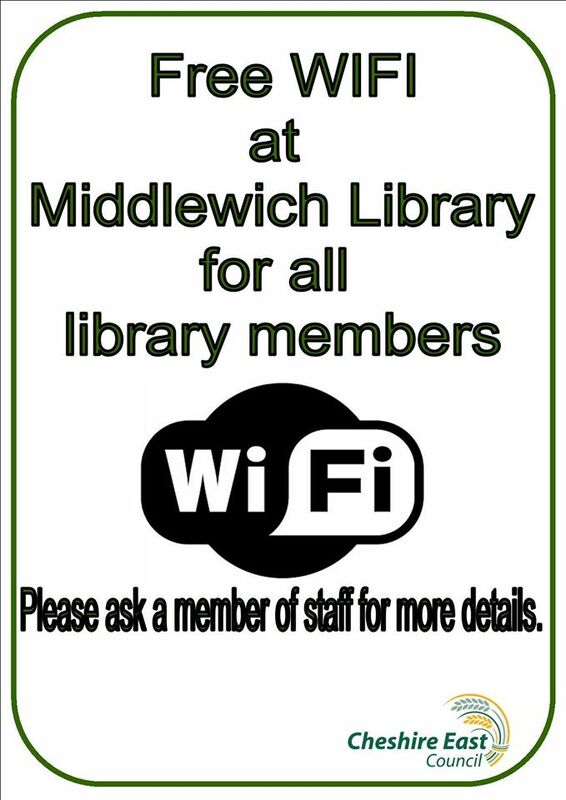 I recall making a short speech in which I said something along the lines of, 'the management may not care about ERF Middlewich, but we do. We've all worked together for so many years, and we think it's only right that we celebrate the fact.' Words to that effect, anyway. 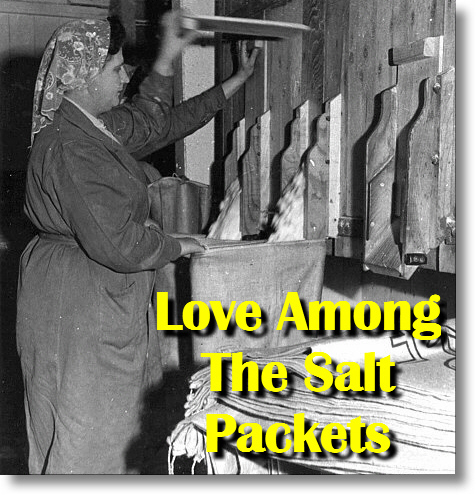 The Salt Town Poets sang a song I wrote specially for the occasion, The Storekeeper, and there wasn't a wet eye in the house. But I never will play the storekeeper no more. They don't want us to play the storekeeper no more. You can stick your spare parts where the sun doesn't shine. But we never will play the storekeeper no more. 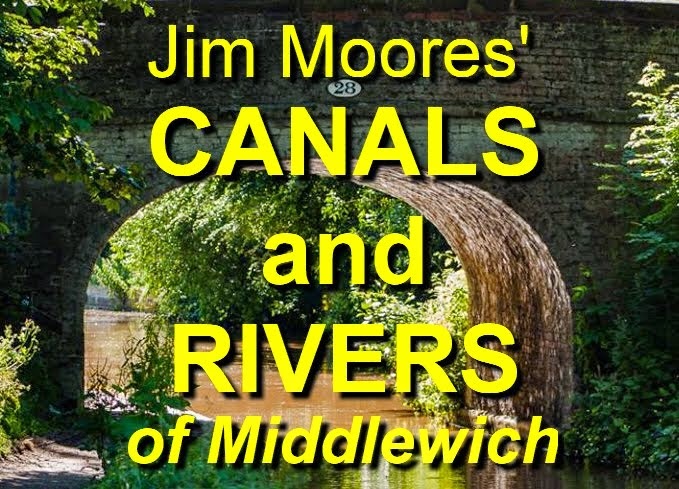 Verse 1: Most of my working life at ERF Middlewich was spent 'booking in' parts, at first by hand on notes later sent in batches to an IT firm in Manchester which compiled weekly print-outs of stock figures. These print-outs were always wildly out-of-date, of course. From the early 1980s I did the same job using a succession of computers. 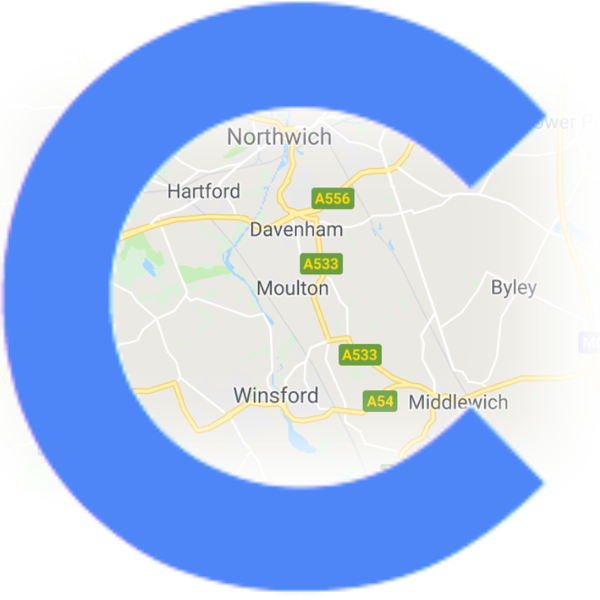 Verse 3: A logistics firm was brought in to examine our parts distribution network, and concluded that it should be 'outsourced' to a firm operating from Burton-On-Trent, giving greater efficiency and effectiveness. We were, as you can gather, sceptical about this, with every justification as it turned out. The song went down a storm. So much so that we had to sing it twice. 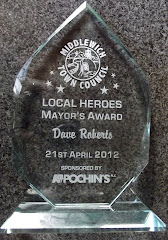 A memorable evening and, as Dave Lewis said on the night, 'only right and fitting'. 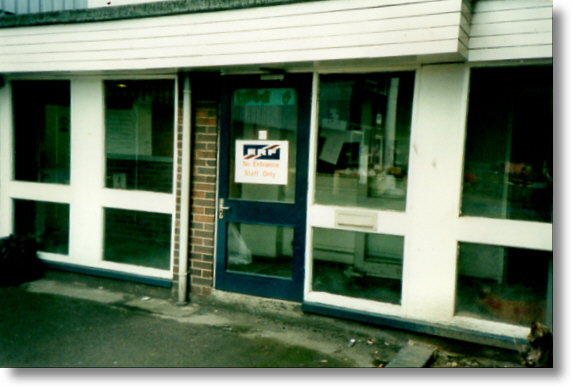 This door, at the side of the old ERF Middlewich office block was the one I used when I left ERF Service for good in the winter of 2000. 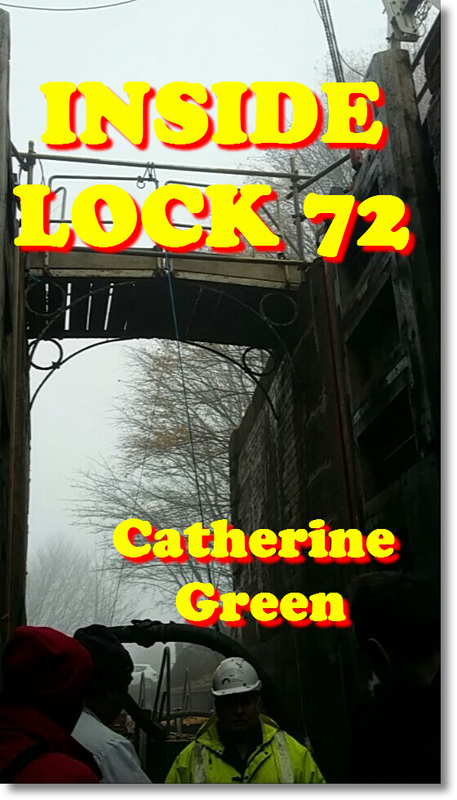 Again, this was only right and fitting, because it was by this same door that I first entered the place back in 1974 for the interview with Bill McArdle which led to my working there for 27 years. By contrast, my working life at the 'new place' lasted less than one day. I'll never forget my time at ERF. I made some good friends and, of course, one or two enemies. We all knew deep down that we were on the way out and that we were living through the last days of the independent British truck industry. 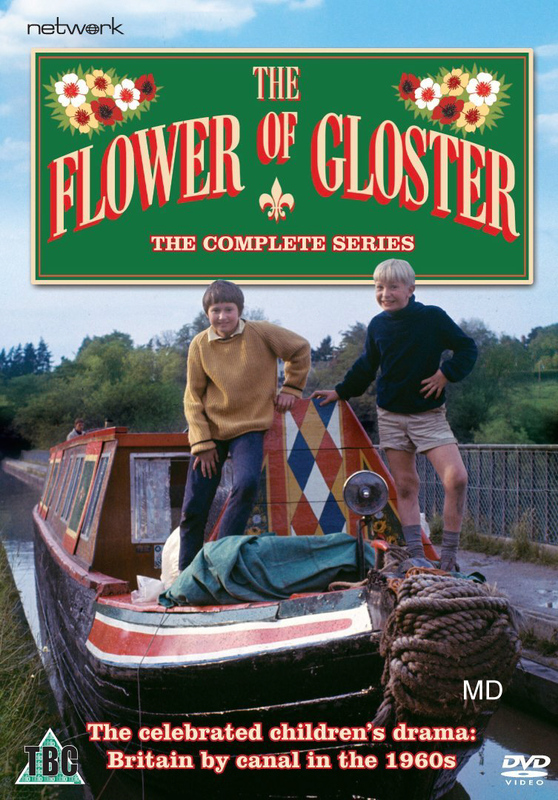 And I think that, despite everything, most of us were proud to be a part of an industry which 'flew the flag' for Britain right to the bitter end. 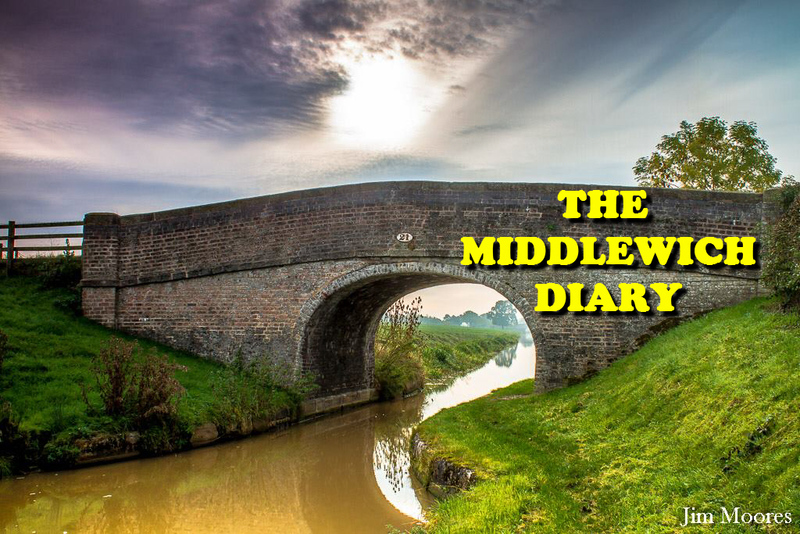 This diary entry will be added to from time to time, as more photographs come to light. 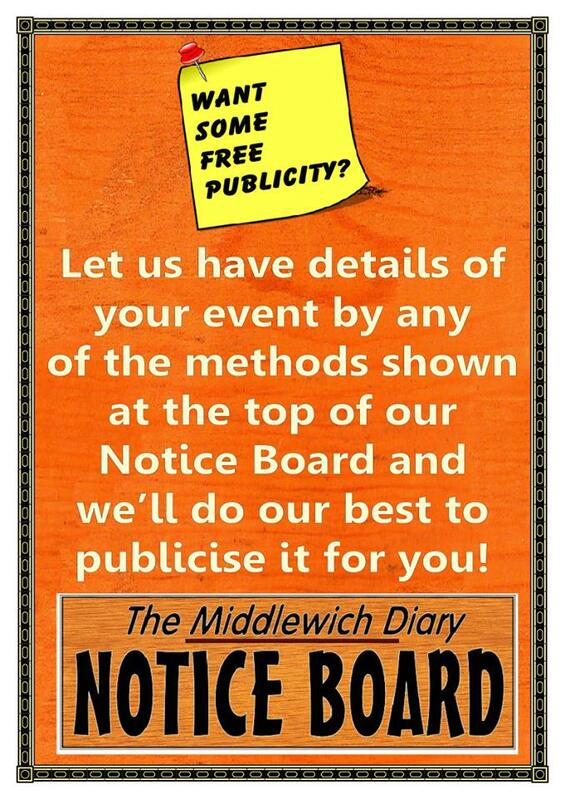 If you have any which you think may be of interest, please don't hesitate to send them to us. 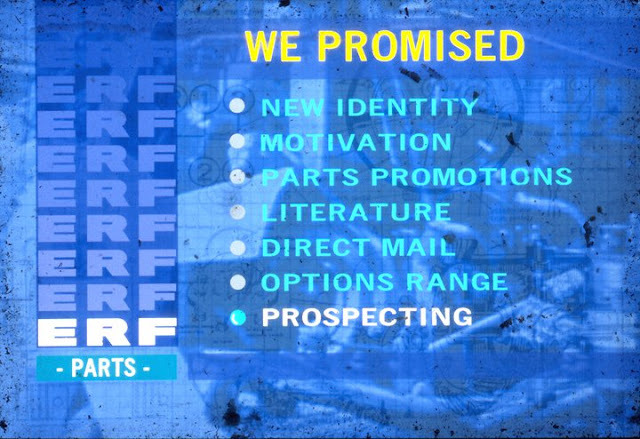 Promises Promises...Here's a piece of ERF ephemera from the days when 35mm slides were the norm for presentations, rather than the now ubiquitous digital projectors attached to laptops. Most probably dating from the early 1990s, it's obviously just one of a series of slides shown to people from the parts distribution network to chivvy them up and get them passionate about selling diffs, gearboxes, propshafts and a myriad other spares, including everyone's favourite,the time-honoured 'No 10 pins' (said to be a remnant of the first ever parts list for ERF 1 in which the parts were simply numbered 1,2,3,4 etc. Part no 10 being a shackle pin for a road spring). 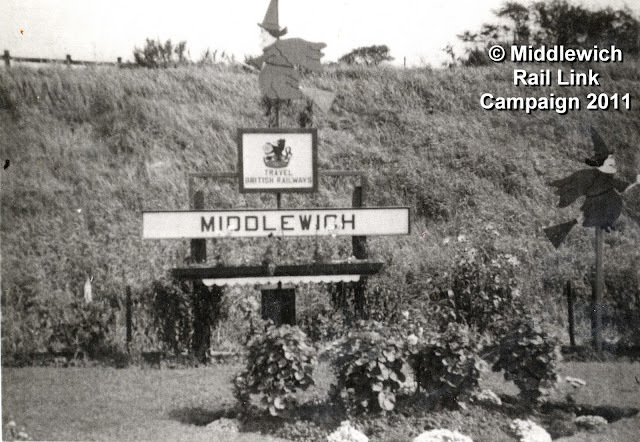 Like all the best Middlewich Diary ephemera, this slide was rescued from a skip. Promoting ERF. 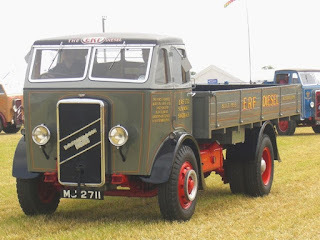 No self-respecting truck company would be without its enamel promotional badges, and you'll still see them pinned on lapels, hats and other bits of clothing at vintage vehicle rallies all over the country every year. These are a few unusual specimens sold on Ebay in 2013. 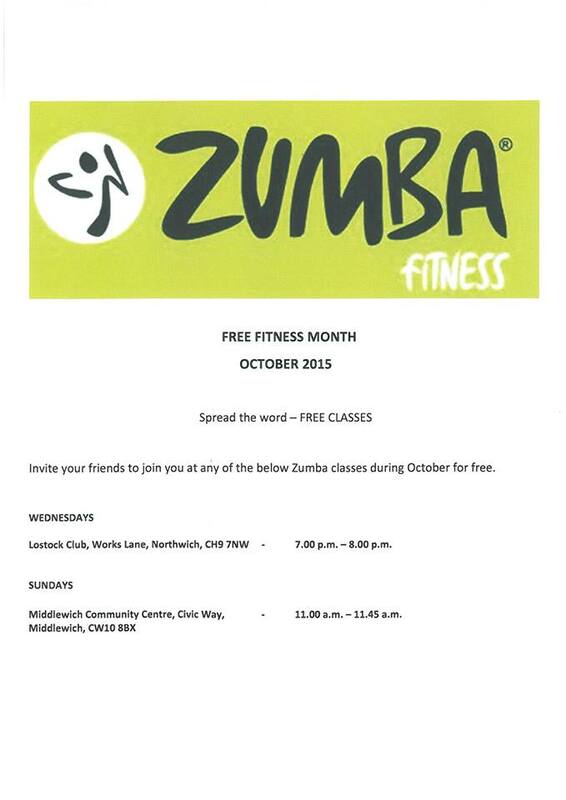 Click on the link (below) for details. That distinctive ERF typeface, which was used, with various different embellishments and variations, on the front of trucks built from the 1950s until the company's demise in the 21st century. We never did find out if it had a name, or whether it was specially developed for the company or just 'borrowed' from someone else. Does anyone know? 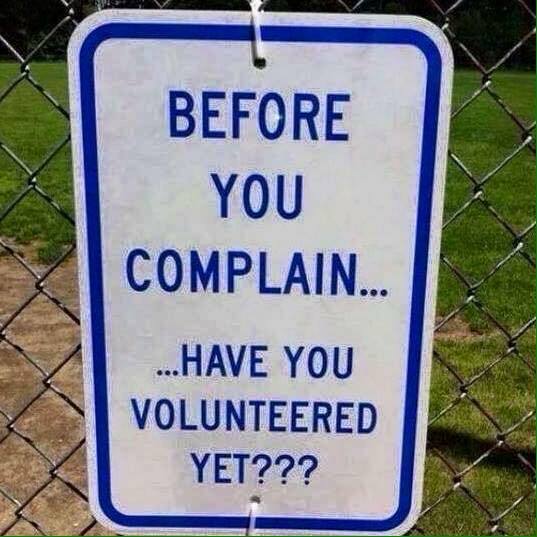 We'd be interested to hear from you if you do. 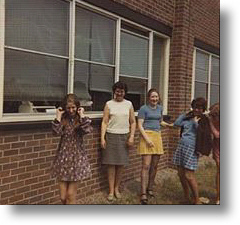 Photo taken outside the ERF Service Service Centre office block, early 70s. 19th September 2017, 3rd October 2017. Labels: BAYLEY HARRY, DAVENPORT STUART, ERF MIDDLEWICH, ERF SERVICE, ERF SERVICE 1971 - 2000, FARRINGTON PETER., FARRINGTON STEVE, HAMPTON HERBERT., LAST DAYS OF ERF MIDDLEWICH, NEVITT MARK, OWEN JOHN. 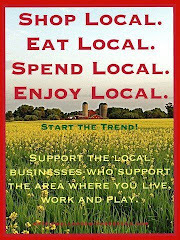 Great to see this. 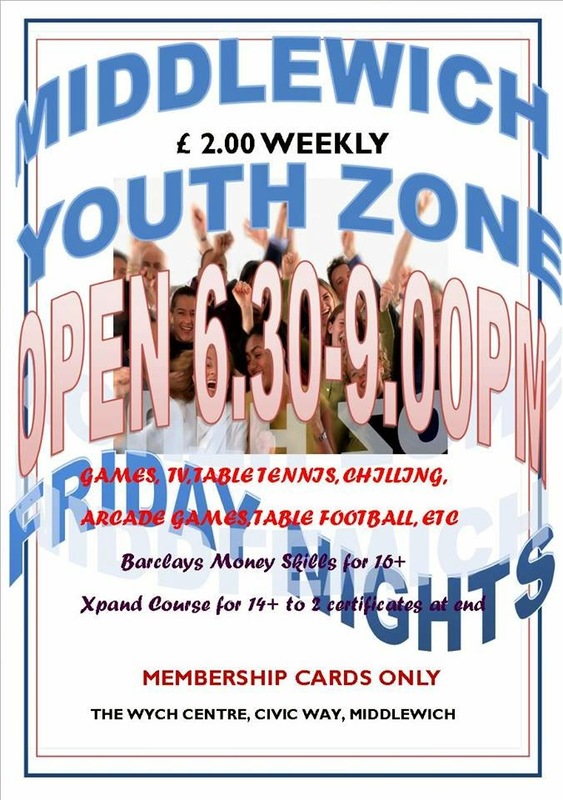 It's a real insight into ERF of days gone by. 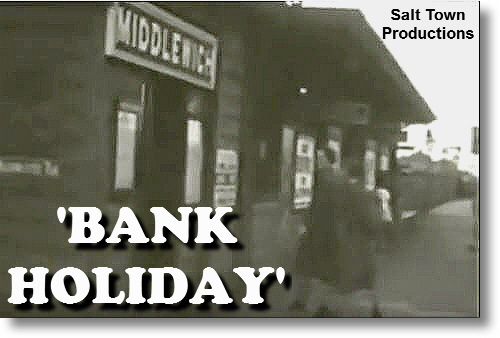 I worked at the Sandbach offices for a short while. Fond memories. like you i would have worked to my 65th there as would most of the team. When you say 'is not' do you mean 'is'? As I say I don't remeber ever hearing her last name. She was a great person to work with. Nice to read but also very sad. 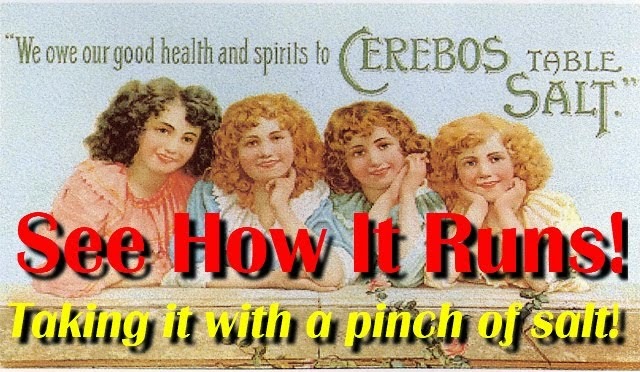 Very interesting article thanks for taking the time and effort putting it all together. 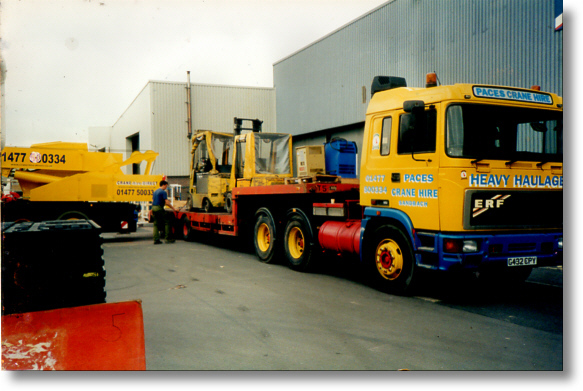 I have a couple of pictures of the ERF MW recovery truck that you had at Middlewhich if you can send me your email address i will send them over. 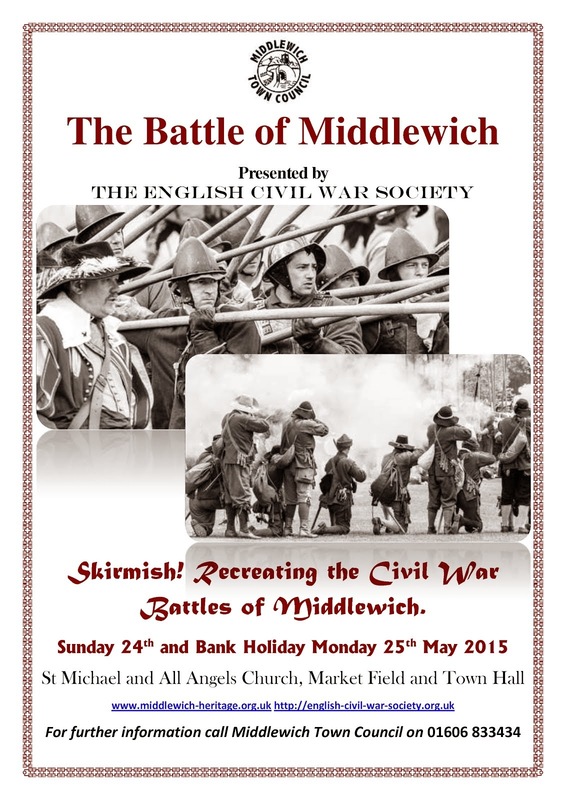 ...and the email address is Middlewichdiary@aol.com. I'll email you separately incase you don't see this. Thanks again! 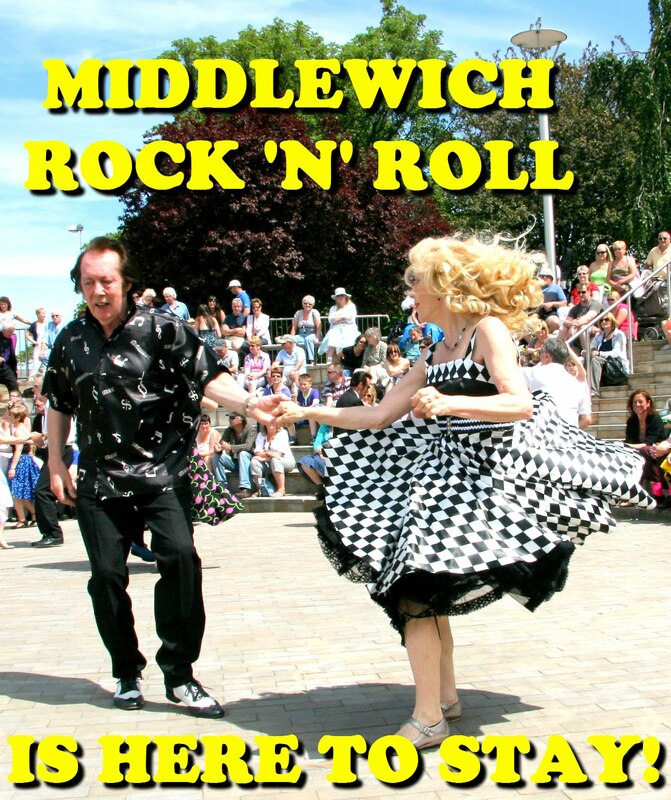 I worked at ERF Sandbach and Middlewich from 1978 - 1990 when I left to have my first child. It was a fantastic place to work. I loved going to work then. Made some great friends and while we worked (honestly) we had alot of fun.